THE MANY WIVES OF ELISHA WILLIAMS, SR.
I’m on a quest to photograph and research as many gravestones of my ancestors as I can. 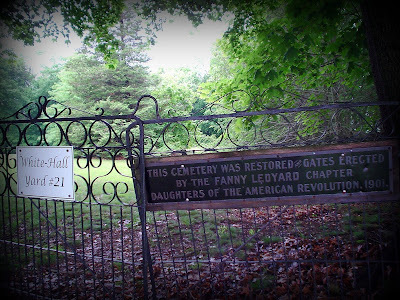 Most are buried in New England in the states of CT, MA and RI and some date back to the early 1700s. My immigrant ancestors were stone-cutters in their native country of Scotland, hence the name of my blog. The spookiest graveyard I have visited holds many important, ancient gravestones. 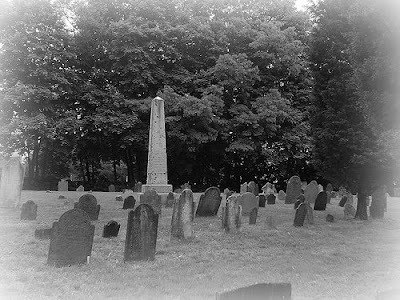 While exploring the graves my husband and I both have experienced an unsettled feeling in the Whitehall burying ground in Old Mystic, Connecticut that we don’t feel in any of the many other local or distant cemeteries we visit. 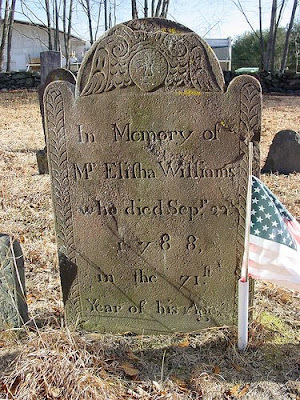 It may be because my mean tempered 5th great grandfather Elisha Williams, Sr. who is buried there may be justifiably haunted by the women in his life. Unlucky in love, Elisha married three local women, each of whom, died before him. He finally married a widow who outlived him and is the only one not buried by his side. 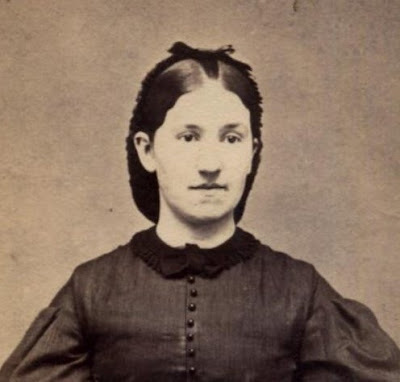 With only two children surviving to adulthood who had different mothers, Elisha was known by the community to be controlling, self-centered and angry. Elisha locked his teenage daughter Eunice in her room to wait for the man he chose for her to marry. Eunice, having her father’s defiant nature, had other ideas as she had her eye on Isaac Denison, who was not her father’s choice. With her father gone to get his chosen son-in-law, Eunice climbed out her second story window, jumped to the ground and ran to her dead mother’s brother’s home for sanctuary. She had to stay there until her father cooled off. Eunice got her way and married Isaac a short time later when she was eighteen. Isaac and Eunice were the parents of a dozen children and lived a privileged life for their time and certainly teenage Eunice’s choice of husband worked out just fine. Did her father hold a grudge? With some research, I discovered that Elisha named each successive daughter after his previously deceased wives. Is this the reason his wives haunt him to this day? Read more about Elisha and his family in the Granite In My Blood blog. 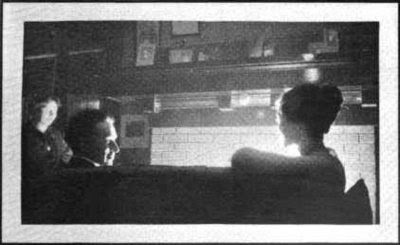 Can you imagine the conversation between my Grandparents when my Grandfather got home from work after projecting Sir Arthur Conan Doyle’s spirit photographs at Carnegie Hall? We’ve all seen the spirit photographs and are quite sure we wouldn’t have been fooled, we are much more sophisticated than the general population of the 1920s. My Grandfather was a photographer, a photographer who had traveled the world with Burton Holmes; I would wager he wasn’t fooled. Not for one moment. I’ve seen some of his photographic manipulations, done for his own amusement. So what did my Grandfather tell my Grandmother when he came home from work? It was April 21, 1922. 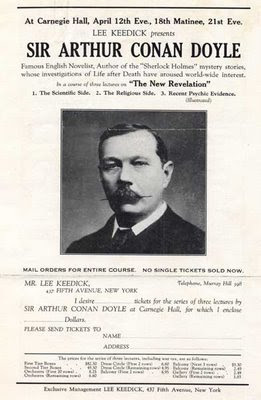 It was the third in a series of lectures by Sir Arthur Conan Doyle, of Sherlock Holmes fame, at Carnegie Hall on the after life. This lecture was “Recent Psychic Evidence,” and was illustrated with spirit photographs projected on a screen by my Grandfather, Edward Jesse Greene. The two previous lectures by Conan Doyle had been very successful and this one would be no different. Doyle had painted a very beautiful picture of Heaven. The papers were full of the skeptics as well as the believers. This lecture tour was quite a money machine, Doyle not only selling tickets, but books as well. Even Macy’s got in on the action selling books on spiritualism. Every seat in Carnegie Hall was filled; filled for the sake of curiosity rather than belief. Doyle prefaced his remarks about the photographs with a short talk on the nature of ectoplasm. Ectoplasm he explained was “the raw material of psychic phenomena." Ectoplasm is the material that appears in the spirit photographs; a living substance of a viscous nature projected in rods from a medium’s body. The first of them displayed a white streak running from the feet of the medium to the under [art of a table at which he was sitting. At the base it was spread out, as if it had been a semi-fluid substance, which had later solidified. So long as it was dark, except for the gleam of the ectoplasm, it was impossible to push down the table which had been lifted, Sir Arthur explained, but the moment the light was turned on the table came down with a crash, showing that the ectoplasm had dissolved. He then showed a group of men and women who are working on the spirit pictures in England. 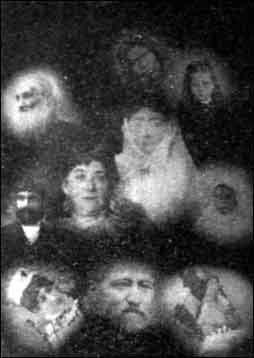 It was suggested that an attempt be made to get a spirit picture from the group, and a plate was furnished by one of them to the photographer. When the plate was developed it showed in the centre the face of the father of one of the men, who had been dead for years. 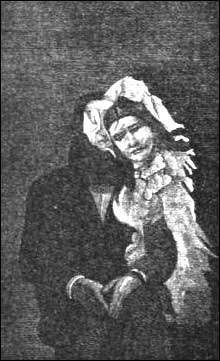 The picture of a “strange apparition,” as Sir Arthur called her, showed a mass of ectoplasm which had been built up into a face, with a mass of the material hanging from her cheek. If the exposure had lasted a little longer this would have built up into her shoulders and bust, he explained. Nearly every one of the pictures showed this white waving mass on the plate, sometimes apparently in folds, sometimes forming an arch over the head and hanging down on one side, often ragged at the edge as if there were more material than could be used. This, Sir Arthur said, was undoubtedly the material projected in quantities from the body of the medium, so much of it that the medium frequently loses twenty pounds at a sitting. He had no doubt that if some of it were cut off the medium would die. The picture of Lady Glenconnor was shown with the hand of her dead son rising on her shoulder. She had dreamed that this would happen, and recorded it, before going to the medium. Another picture she had taken, however, showed a face strange to her. 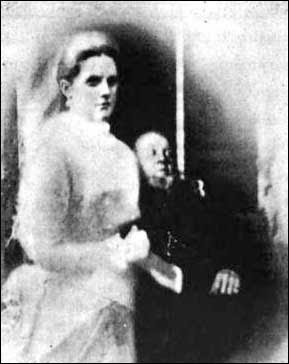 Later, Sir Arthur said, another couple tried to get a spirit photograph of their son without success, and a medium told them that their son had materialized in Lady Glenconnor’s picture. They went to her and recognized their boy. He had a bullet hole through his head, having been killed in the war. When Sir Arthur went to the psychic photographer, whom he described as a religious little man, a carpenter, who did his work for almost nothing, he took his own plates and put them in the camera himself. Later he developed them himself. The first one did not show his son, but did show a bulbous mass of ectoplasm on which was written, ‘Well done, friend Doyle. I welcome you to Crewe. Greetings to all. T. Colley. 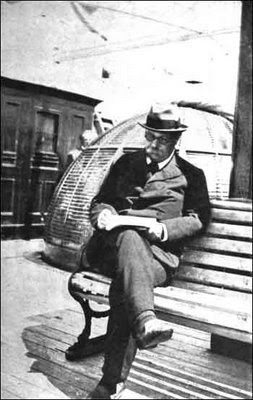 Sir Arthur Conan Doyle in 1919. Doyle from the deceased Archdeacon Colley. The signature thrown on the screen was almost identically that written on the psychic picture. He took another picture. One of the most interesting pictures was one taken by Colonel Johnson of the Indian Medical Service. It was of a ‘venerable old spirit” named Malachi, who was a ‘control’ on the their side. Colonel Johnson got a picture of him with a book under his arm, and being curious about the book wanted to know if he couldn’t get a page of the book in another picture. Then Sir Arthur showed the weirdest photograph of all. It was a shadowy reproduction of old Malachi, so diaphanous and unreal that it seemed as if the background showed through. He was a quaint old figure, with an ancient face like a carving, so many were the lines on it and crouched as if of great age. By his side, formed out of the mass of ectoplasm, was a printed page so distinct that it could be read, but the language strange to those that tried to decipher it. The applause from the audience was mostly sympathetic to the photographs the New York Times called unusually weird or pathetic. Bishop Berry of Philadelphia suggest Doyle be examined by a commission in lunacy. To the end Doyle led the spiritualism movement and promised to contact his family from the other side. DOYLE SHOWS SPIRIT PICTURES OF DEAD: Some of Men Killed in War, One Exhibiting a Bullet Hole in Head. HE DENOUNCES SKEPTICS Audience, Filling Every Seat in Carnegie Hall, Seemed to Be Sympathetic. Large Audience Curious. DOYLE SHOWS SPIRIT PICTURES OF DEAD Description of the Pictures. Mother and Dead Son Shown. Likeness of Dead Son Shown. Message Written in Singalese. (1922, April 22). New York Times (1857-Current file),p. 1. Retrieved October 20, 2008, from ProQuest Historical Newspapers The New York Times (1851 - 2005) database. (Document ID: 103587028). Doyle, Sir Arthur Conan. The New Revelation. New York: Akasha Publishing, LLC, 1918. Photographing the Invisible: Practical Studies in Spirit Photography, Spirit Portraiture, and Other Rare But Allied Phenomena. Chicago: L.N. Fowler Co., 1911. Lidian, of The Virtual Dime Museum, commented on the recent Shades articles concerning Spirit Photography. She mentioned that Sir Arthur Conan Doyle had been taken in by spirit photography as had many others. This is the perfect segue into how spirit photography, Sir Arthur Conan Doyle, and the footnoteMaven come together at a point in time. My six degrees of separation. In April 1922, Sir Arthur Conan Doyle traveled from England on board the White Star Liner, Baltic, with his wife, Lady Doyle, and their three children to lecture at Carnegie Hall on "the after life." Sir Arthur Conan Doyle’s oldest son had died in the war. During a seance in England the boy had returned and had begged his father’s pardon for refusing to help in the Doyle family seances before the war and had come back to his father by those very means. Doyle said that after the spirit of his son had received its pardon it placed its hand upon Sir Arthur’s head, kissed him on the brow and disappeared. It appears Doyle believed because he needed to believe, wanted desperately to believe. Louis Salter, my Great Grandfather, was the manager of Carnegie Hall when Sir Arthur Conan Doyle lectured there, April 12, 1922. The lecture was illustrated with stereopticon views. The stereoptician was my Grandfather, Edward Jesse Greene. What I wouldn't give to have been there. 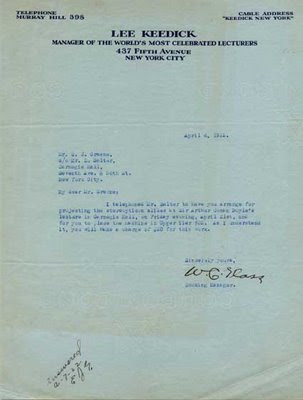 Below is the letter from Sir Arthur Conan Doyle's manager, Lee Keedick, detailing the work and confirming my Grandfather would receive $20 for his services. Also included here is one of the only known brochures distributed by Keedick for Sir Arthur Conan Doyle's lecture at Carnegie Hall. It tells the story of Doyle's spiritualism. Tomorrow Shades will continue the story with Doyle's reception at Carnegie Hall and what my Grandfather witnessed. Sir Arthur Conan Doyle, whose achievements as an author have placed him in the front ranks of the literary world, has aroused worldwide interest in recent years by his investigations of psychic phenomena. Today he holds a foremost position among the increasing number of eminent men engaged in psychical research, who have labored conscientiously to supply conclusive answers to those great questions of the ages: “After death, what?” “can the dead communicate with the living?” Carrying into this work the profundity of thought and marvelous powers of deduction which brought him fame as a writer, this brilliant Englishman has become convinced that human survival beyond the grave can be absolutely proved. It can be confidently predicted that the audiences will greet Sir Arthur Conan Doyle in this country will more than equal those he has addressed in Great Britain and other parts of the world. During his recent tour in Australia he aroused such intense enthusiasm that the largest halls were repeated crowded by the vast numbers of people eager to hear his lectures. On leaving for England he was publicly presented with an illuminated address in recognition of his splendid work. It is not generally know that Sir Arthur Conan Doyle entered the field of science before he achieved fame as a writer. He is an L.L.D. of Edinburgh University, and as a practicing physician in London he made a name in the medical profession before producing his first novel. The training enabled him to supply a scientific background for his famous stories of mystery, in which his great character, “Sherlock Holmes,” filled the leading role as a detector of bewildering crimes. For a generation past these remarkable stories, in which amazing powers of invention and deduction are shown, have been read and admired by millions throughout the English speaking world. In addition to producing numerous novel and serious works, Sir Arthur Conan Doyle has been a prolific contributor to the leading magazines and other periodicals, his articles, in recent years, having dealt very largely with psychical research. His work in this connection has taken him to all quarters of the globe. He has traveled from the arctic to the equator, through South Africa and America. From the beginning he has been an earnest inquirer along scientific lines. In his lectures in this country Sir Arthur Conan Doyle will not confine himself to a mere discussion of theories, but will present the very latest evidence on the subject of life after death, including actual photographs illustrating psychic phenomena, which will be thrown upon the screen. He will relate his experiences and sum up the conclusions he has been able to reach. Lee Keedick Correspondence to Edward Jesse Greene. Privately held by the footnoteMaven, [ADDRESS FOR PRIVATE USE,] Preston, Washington. Lee Keedick. The Revelation. Brochure. 1922. Privately held by the footnoteMaven, [ADDRESS FOR PRIVATE USE,] Preston, Washington. my collection of old photography books, magazines, and newspapers. The witching hour approaches and Shades turns to the spirits in photography. For many years spirit photography ran rampant through the lives of believers and non-believers. This week Shades looks at two previously published articles, 1876 and 1911. One for those born every minute and one for the skeptics. Was not spoken of the soul,"
Seems indeed to be fully realized and proven in this wonderful age of startling discoveries. 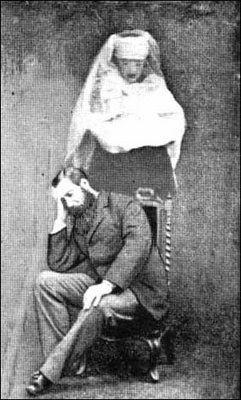 Spirit photography, it has been claimed, has solved this momentous question; and various persons, from time to time, have claimed the peculiar power of placing their hands upon the camera, by which means the instrument became "sensitized," so as to enable "spirit forms" to impress their image on the plate with the sitter. Among others, Mr. Jay J. Hartman has claimed this power, and has been producing" spirit pictures" at Teeple's gallery, No. 100 West Fourth Street. He has been bitterly denounced as a fraud and trickster by the skeptics and unbelievers, and lately one of the morning contemporaries gave three columns of sensational arguments and statements to prove that the whole matter was a delusion, and Hartman a miserable humbug. Although he gave private test-sittings that seemed satisfactory, yet even many of his friends began to doubt him, until he, last week, published a card that on Saturday morning, December 25th, he would give a free public investigation, addressed to the public generally, and to photographers especially; stating that he would place all the arrangements in the hands of those taking part in the investigation; they to choose the room where the trial was to be held; bring their own marked plates; furnish their own camera, chemicals, in fact every thing; Hartman simply asking to manipulate the plates in the presence of practical photographers, to show that he used no fraud or trickery. Christmas morning came, bright and cheerful, and found sixteen gentlemen, five of them practical photographers of this city, assembled at" his rooms. Putting the question to vote, it was decided to adjourn to the photograph gallery of Mr. V. Cutter, No. 28 West Fourth street, Mr. Cutter being an expert in detecting the "spirit-picture trickery," and, as Mr. Hartman had never been in his gallery, he would be at the double disadvantage of being in a strange room, surrounded by strong skeptics, and practical men quick to detect fraud. Mr. Hartman cheerfully accepted, exacting but one condition — that there should be no arguments, jesting, or unbecoming conduct, in speech or action, liable to produce discord, and disturb the harmony and quiet necessary to insure results. 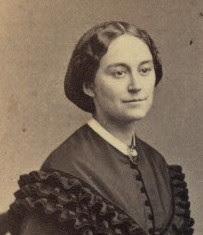 in Cincinnati, in March 1876. As the offer was made by Mr. Hartman in a perfectly fair and gentlemanly manner, it was accepted in like good spirit, and the party adjourned to Mr. Vincent Cutter's rooms. Entering the operating room, the party were requested to seat themselves on each aide of the camera, and join hands. Mr, Hartman then desired to be searched and blindfolded, but the photographers waived this as, being unnecessary. Mr. Hartman then chose Mr. F. T. Moreland to represent him, and see that everything was; done fairly. Then, selecting Mr. C. H. Murhman, a practical photographer and strong skeptic, the three entered the dark room, Mr. Murhman selecting his own plates. The plates prepared, they approached the camera, Mr. Murhman carrying the plate, and then sitting for a "picture." Amid breathless silence the plate was exposed and carried back to the dark room, Mr. Hartman following. Soon came the cry, "No result." Skeptics somewhat jubilant. Another plate was ordered. Mr. Murhman again followed Mr. Hartman through. No result. Unbelief above par, and rising rapidly. Mr. Cutter, the proprietor of the gallery, a strong skeptic, and probably the best expert in the city, was now chosen to go through the workings. Hartman seemed downcast, and, declining to enter the dark room, stood at the camera, seemingly absorbed in deep meditation or prayer. His friend Moreland and Mr. Cutter entered the dark room alone, Mr. Cutter preparing the plate. Coming out to the camera, and giving Hartman the "holder," he seemed so much abstracted as to be scarcely able to place it in position. Calling to two gentleman to place their hands on the camera with him, the third plate was exposed with no result. Affairs looked gloomy, indeed, for poor Hartman and his friends. But he directed Mr. Cutter to prepare another plate, and dropped into a deeper state of abstraction than ever. Mr. Murhman sat close beside Hartman and the camera, closely watching every movement, as he is well calculated to do from his long experience in detecting " professional mediums." Mr. Cutter, having finished the preparation of the plate in the dark room in the presence of Mr. Moreland, brought the fourth in the "holder," and handed it to Mr. Hartman. Selecting Dr. Morrow as the "sitter," and a third person to place hands on the camera, the plate was again exposed amid intense, breathless silence. Hartman visibly trembled, and appeared to be engaged in deep, silent invocation. The hands of the persons resting on the camera likewise visibly trembled, showing the presence of some occult power. Finally Hartman ended the painful suspense by covering the camera, when Mr. Cutter took the plate, and, accompanied by Mr. Moreland, retired to the dark room to develop it, leaving Hartman standing at the camera with great beads of perspiration studding his brow, while the assembly looked like "grave and reverend seignors," awaiting a verdict that was to blast the fond hopes of the Spiritualist — and prove that "life is but an empty dream." But quickly came the joyful exclamation from Mr. Moreland, and the astounding cry from Mr. Cutter — a result! A ripple of quiet joy ran over Hartman's countenance, while his friends, scarcely believing the good news possible, crowded, with the skeptics and unbelievers, who doubted the evidence of their own senses, around Mr. Cutter, who held the glass plate up to the light; and there, sure enough, impinging on the head of Dr. Morrow, was the clearly denned face of a young lady, even clearer and more distinct than his own. Every one was astonished at this unexpected result. Murhman looked at Cutter, and Cutter looked at Murhman in blank amazement, declaring that he didn't do it, as it was one of his own plates, and he knew there was nothing on it when it went into the camera. There was the picture! Hartman had never touched the plate, or entered the dark chamber during its manipulation. How it got there, he didn't know; there it was. While skeptic and Spiritualist were equally astounded, the best of feeling prevailed, and, to the credit of all be it said, not a harsh, ungentlemanly word was dropped by any one during this great and conclusive trial. Conclusive, in that, while Messrs. Cutter, Murhman, et al., do not admit the "spiritual" origin of the form on the plate, yet they all agree that Mr. Hartman did not, and could not, under the circumstances of never touching the plate, or entering the dark room, produce the "spirit picture" by fraud or trickery. There is the face of Dr. Morrow, with the face of a young lady, with something resembling a wreath arching over their heads. Whence came it? If it is not what it purports to be, a "spirit form," what is it? And how came it there? All finally agreed to sign the following certificate, as justly due to, and fairly earned by Mr. Hartman: "We the undersigned, having taken part in the public investigation of 'Spirit Photography' given by Mr. Jay J. Hartman, hereby certify that we have closely examined and watched the manipulations of our own marked plates, through all the various workings, in and out of the darkroom, and have been unable to discover any sign of fraud or trickery on the part of Mr. Hartman. And we further certify that during the last sitting when the result was obtained, Mr. Jay J. Hartman did not handle the plate, nor enter the dark room at any time. "J. Slatter, C. W. Murhman, V. Cutter, I. P. Weekman, F. T. Moreland, T. Temple, (all practical photographers.) E. Saunders, Wm. Warrington, Joseph Kinsey, Benjamin E. Hopkins, G. A. Carnahan, Wm. Sullivan, James P. Geppert, D. V. Morrow, M. D., E. Hopkins, and Robert Leslie." Mr. Murhman demurred to the first part of the certificate, not that he had discovered fraud, but that he was not in the dark room when the result was obtained, but cheerfully signed as to the last clause, and with the balance exclaims: " Thertfs the fact, who can explain it?" I will also refer the reader to a pamphlet put forth by Mr. Mumler, of Boston, on his own experiences in Spirit-Photography. 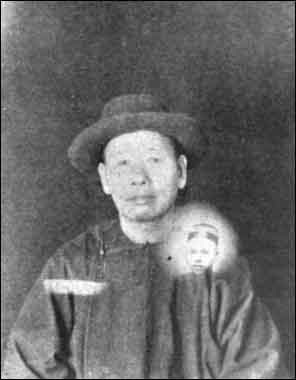 He gives many well attested cases of pictures taken by him, which have been unmistakably recognized by relatives and friends as the faces of those who are in the spirit world. Mr. Mumler is the gentleman who some twenty years since, more or less, underwent a public trial in New York city, and was triumphantly acquitted. Shindler, Mary Dana. A Southerner Among the Spirits: A Record of Investigations Into the Spiritual Phenomena. Memphis, Tennessee: Southern Baptist Publication Society, 1877. p. 49. You Know What P. T. Barnum Said? The latest we have heard in "Spirit Photography," under the title of "Some Unusual Phenomena in Photography," is a series of wonder tales, as set forth in the journal of the American Society for Physical Research, under the direction of Dr. James H. Hyslop. It seems that he alleges to have made personal tests of the photographic work of a woman who felt she was endowed with supernatural photographic powers, and submits his investigation to the public. 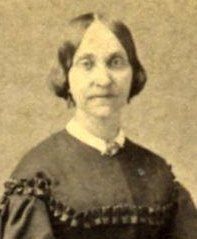 This woman, Mrs. Marguerite DuPont Lee, received no results until she enlisted the services of William M. Keeler, a former "spirit photographer," whose work, years ago, was found to be a fake, pure and simple. According to Dr. Hyslop's report, Mrs. Lee did some marvelous things with her camera. Upon having the negatives developed, she discovered curious lights and shadows upon the prints. 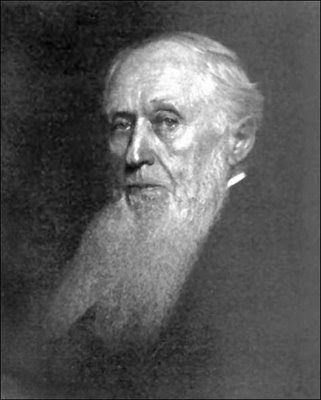 Again, the camera was focused upon a black curtain, the alleged photo showed the portrait of a Mr. Bocock, an Episcopal clergyman, who had been dead a number of years. 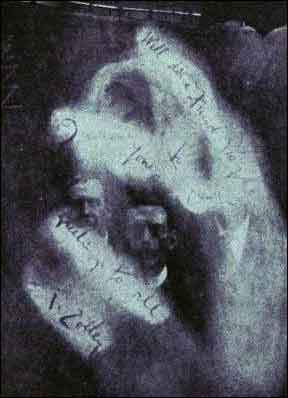 After that, writings from Mr. Bocock, with his signature, began to take the place of photographs. At another time, Mrs. Lee tied on her forehead, a 4 x 5 plate, inclosed in an opaque envelope; it remained there for over an hour, when printed, the picture was one of the human brain. Unbelievers would call these phenomena nothing more than double exposures, light struck, or reflected lights; however, Mrs. Lee is sure she is mediumistic, and asked Dr. Hyslop to investigate her photographs. Skepticism is justified, as it is evident that Dr. Hyslop is too anxious to believe in "spirit photography." "You Know What P. T. Barnum Said?" Bulletin of Photography: The Weekly Magazine for the Professional Photographer. Philadelpheia: F.V. Chambers, 1915. p. 503. Coates, James. Photographing the Invisible: Practical Studies in Spirit Photography, Spirit Portraiture, and Other Rare But Allied Phenomena. London: L.N. Fowler' Co., 1911. p. 338. 31 October - And The Guest Author Is . . . It's Halloween week at Shades and there couldn't be a better collector for this Friday than Midge Frazel, keeper of graveyard secrets at Granite In My Blood. Her immigrant ancestors were stone-cutters in their native country of Scotland, hence the name of her blog. Midge has the perfect Halloween story for the readers of Shades. 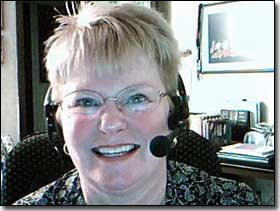 Midge Frazel, family historian, educator and writer, holds a Master’s Degree in educational technology. She has been researching her family (and other people's too) for more than thirty years. Midge is a Mayflower descendant, a member of the DAR, and a member of the professional genealogist organization APG. A technology consultant specializing in education, Midge has taught workshops for teachers, administrators and librarians in Southeastern Massachusetts for many years. She is the author of eight books for teachers with two more in progress. She loves everything technological and is an only child whose destiny was to be involved in genealogy after seeing photographs of her 2nd great grandparents when she was only eight years old. 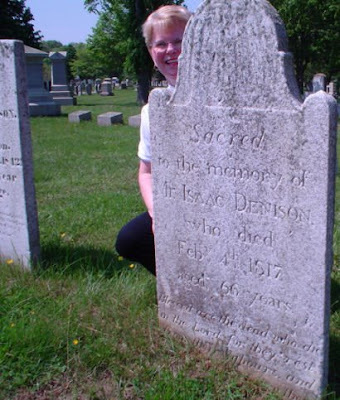 Her blog, Granite In My Blood, serves as a shared resource for those who are interested in gravestone photography, genealogy and family history. Most of the photographs are of her ancestors or of cemeteries she is photographing, transcribing and researching. Midge is also a Charter member of The Graveyard Rabbit Association. Join Shades 31 October for Friday From The Collectors when Midge Frazel takes us on a stroll through the mist and the gloom as a Halloween treat. 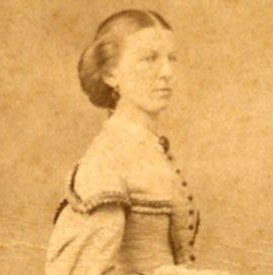 An often overlooked aspect of a woman's fashion during the American Civil War period is her crowning glory, her hair. Just like today, a woman could (and did) spend quite a bit of time making sure that she looked her best, and her hair was quite often a source of pride. Because styles and fashions have certainly changed quite a bit since the 1860s, the present day living historian can sometimes have quite a bit to learn and work around to achieve "the look" necessary to create the impression that she is indeed someone who has stepped out of the mists of time or the pages of a book. First on the list for those trying to achieve the proper hairstyles of the period is to make sure that a few misconceptions are taken out of the picture, so to speak. For one thing, contrary to some sources a woman not only bathed, but washed her hair more than is generally supposed. Some assert that a woman did not bathe very much at all, least of all her hair. After all, ladies' hair frequently looks slicked down and greasy to the modern eye. While her bathing habits may not be those of people today, she certainly did keep herself clean, and her hair was no exception. A full immersion bath was very labor intensive, commonly reserved for Saturdays so that she and her family could be clean for Sunday church services. 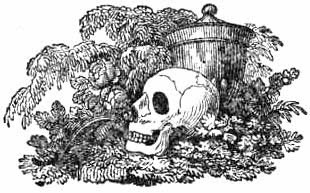 During the week she generally used an ewer (a pitcher) and a wash-basin filled with water located in her bedroom in order to spot-clean herself, such as her face and hands, neck and arms, and other places that I'll leave to your imagining. Underpinnings that had direct skin contact such as collars, cuffs, chemises, pantalettes and petticoats were frequently changed and laundered, though the dress itself may not be washed nearly as frequently, and sometimes depending on the type of cloth and fastness of the dyes among other factors, some were not at all. A lady's hair could also be washed in the privacy of her bedroom, and recipes, advertisements and other evidence shows a profusion of hair products, some of which would be familiar to us today. There were herbal rinses, conditioners, dyes and special soaps specifically formulated for hair care. Some items may not be as readily recognizable such as powders, pomades/pomatums and bandolines, but their uses were similar to what hair products do for us today: style and hold the hair in its desired place and form. An excellent tool for figuring out just what hairstyles were like back in the late Victorian period are naturally photographs. Girls and ladies are shown they way they really were, not the way an artist can sometimes use his license to interpret them. Through photographs we can not only determine common elements in hair styles and clothing, but also things like the differences between age, region, and relative affluence. By far females had long hair rather than short, though there are some photos of younger girls and women with short hair. More commonly though, rather than it being a fashion statement, it was due to less pleasant circumstances such as a recent severe illness (hair was sometimes cut short in an attempt to lower a fever), her hair was severely damaged somehow, or perhaps a recent infestation of lice. A lady's hair was center parted neatly but rather severely by our standards, and the bulk of her hair was confined to the back of the neck and skull. Stray hairs were minimized through treating the hair with oils, pomades, and pinning. Come about the age of twelve or thirteen, girls began wearing their hair in imitation of their elders. Prior to that it was frequently in braids or curls. Bangs did not come around to common fashion until the 1880s. Just like a lady's clothing, her hair was styled in order to emphasize the relative narrowness of her waist, and so her hair during this time does not go up, but rather goes out and back. A broad (not necessarily fat) face was the preferred look. This was frequently augmented by the use of hair rolls made of her own saved hair, called rats. These were tucked beneath a section of hair and pinned in, then covered. Hair nets or cauls were in frequent use, generally by the younger (under 25) set. These were made of natural fibers in a broad net pattern, matched the hair as closely as possible, and were secured by ribbons and pins at the crown. Much fancier nets made of richer materials were sometimes worn for formal evening activities such as dinner parties, theater-going, or balls. As with any other culture and society, there were of course differences in taste and marks of individuality shown through fashion, and hairstyles were no different. But with living history, one is generally concerned with the norm rather than the exceptions, as in this way we may more accurately convey a sense of how aspects of life - even how one wore their hair - was done "back then." All photographs in the collection of the author. If you read Shades first Q&E Column "A Flash In The Pan" about flashlight photography, then you may want to limit the taking of flashlight pictures to the great outdoors. I think I'd rather be any place other than in my living room when the explosion goes off. That wide-eyed stare can't make for a pleasing portrait. When most people think of flashlight pictures, they think of them being made in a room only, but you will find that you can get many pleasing effects out in the yard. Instead of holding the flash up above your head, as is customary in a room, place it down on the ground at one side, being sure to get it behind the lens of your camera. You will find that this will give the effect of a camp fire picture. To make it more realistic, you can tint the print. One of the best methods of tinting a picture to get a camp fire effect, is to buy a package of dye at the corner drug store — just common dye that is used for dyeing cotton or woolen goods — getting the most brilliant scarlet they have and make a weak solution and dip your prints into it, leaving them a minute or two, then remove them and lay them out to dry. A few of these kind of prints will add a bit of dash and color to your Kodak book." Another way of getting a good firelight effect, if you happen to have fireplace in your home, is to place a flashlight powder down on the hearth, but you will find it a little more difficult than making the outside firelight picture as explained above. You will have to place a chair or a large sette between the camera and the flash-light powder because if you don't you will find that the light will be too strong and cause flare spots or halation. The above prints are good examples of how you can make firelight pictures with a flashlight, and also how a large sette was used between the flash and the camera to get the effect. The way described is not the only method, the following is also recommended: Some readers may prefer flash sheets because they are less startling than the flash cartridge, effects may be secured by this means, equally good. Shinn, Cobb X. "Firelight Pictures." Camera Craft By Photographers' Association of California. 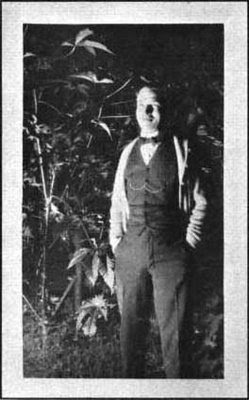 1921. pg. 227-229. 24 October - And The Guest Author Is . . . Shades is so pleased to have Melissa Strobel of In The Swan's Shadow as the Guest Author for Friday From The Collectors 24 October. 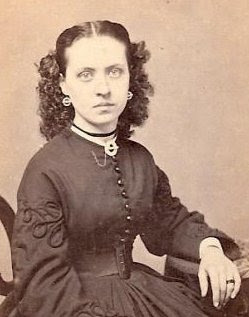 Melissa will show us the Civil War photographs she researches to faithfully reenact the hair and dress of the period. Blessed with amazingly tolerant parents, my love affair with history and genealogy began at a young age. I was born, raised and...well, still living in the Pittsburgh area. I frequently work in and around Gettysburg, which is my first love. When I graduated high school and started college I began my hobbies in living history and medieval recreation groups, with an eye toward public history as a career. 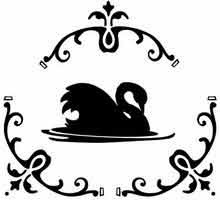 Several years and a family later, I have developed a background in American History and Sociology, and have worked with museums, genealogical societies, (American) Civil War roundtables, historical societies, living historians/historical interpreters, and started The Ebon Swan, a jewelry business focusing on pretty things with historical roots. Presently I am director of the 11th Pennsylvania Volunteer Infantry, Company I American Civil War living history group, and am the Seneschal (president) of my local chapter of the Society for Creative Anachronism (SCA). Join Shades 24 October for Friday From The Collectors when we are treated to Melissa Strobel's outstanding research and love of the Civil War. I’ve read articles from the turn of the 20th century of people having a “flashlight picture” taken. What is a flashlight picture? I have my suspicions but I’d rather have a “maven” give me the definitive answer. "The Whist club was entertained Tuesday evening by Mrs. Hawley Kentner and Mrs. G.W. Allen at the home of the former. In honor of St. Patrick's day the members appeared in costumes representing the typical sons and daughters of the Emerald Isle. The result was somewhat startling as well as exceedingly laughable, and their appearance forcibly illustrated the old proverb that "dress makes the man"— and the woman too. All the costumes were "Pat," but it was generally conceded that Mrs. Alice Dewey. Mrs. I.L. Smith and T.R. Evans bore off the palm in imitating the genuine bog trotter. Edward R. Jones made a decided hit in appearing as an Irish dude, and Dr. J. H. Watson created a sensation by carrying a genuine shillalah. After the company had assembled a flashlight picture was taken and each one was given a typical Irish name, and all drew partners for whist by cards upon which the assumed names were inscribed. The house was appropriately decorated in green, in which ribbons, smilax and other accessories combined to produce a novel effect. The table was especially beautiful with its trimmings of graceful vines and lighted with green tapers. The color scheme was carried out in the menu as far as possible, in the jellies, cream and cakes. The menu cards were in the form and color of the shamrock as well as the place cards, on which were written the names of celebrities suggesting the name of each one present. It took a good guesser to find his place. After refreshments came whist. Five tables were played. Mrs. H.N. Gaylord and James Whittlesey captured the favors. Mrs. Louise Strong and T.R. Evans got away with the consolation prizes. Altogether it was a decidedly novel and unique entertainment and proved one of the most enjoyable of the meetings. It is expected that the next meeting will be the last one of the season." "Turin," The Journal and Republican, Lowville, Thursday, March 19, 1903, Vol. 44, No. 17, p. 1. And your suspicions are probably correct, Thomas. Those old west movie images of a photographer holding a flash pan and a white flash of light would be correct. A flashlight picture was a photograph taken with a brilliant and instantaneous magnesium light used at night or in dark interiors. Flashlight was a significant technical development used for illumination from virtually the beginning of snapshot photography. The light source generally takes the form of either a flash lamp or a flashlight mixture - ignited by the application of a spark or flame. Magnesium is usually the base of most descriptions of flashlight. Magnesium wires or ribbons were often used for the purpose. Magnesium burns very rapidly, in the form of powder or dust, when brought in contact with a flame and gives an intense white light. 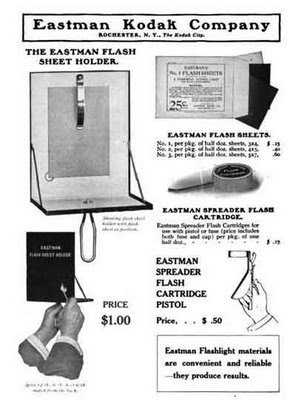 The best form of flash lamp for general purposes was that known as the "blow-through." It consisted of a reservoir with the lamp attached. The reservoir contained a supply of pure magnesium powder. A sufficient quantity of the powder required to make a flash is blown through the flame of the lighted lamp. A flame is formed by burning cotton wick or other suitable substance soaked in methylated spirit, and attached to the hole through which the magnesium is blown. Pressure on a pneumatic ball attached by a tube to the reservoir serves to blow a charge of the powder into the flame to make the necessary flash. A more rapid flash and one spread over a broad area was achieved by the use of gun cotton. Magnesium could burn even more rapidly if mixed with some chemical substance rich in oxygen - such as chlorate of potash. These mixtures, however, constituted explosives and were extremely dangerous. 1919 - W. W. Stroud, of The Barber Kodak and Supply Co., Raleigh, N. C., may suffer the loss of one eye and his left hand as a result of a bottle of flashlight powder exploding in his hand while he was attempting to take a flashlight picture in one of the departments at the R. J. Reynolds Tobacco factory on April 26th. He was working with an electrical apparatus which was used for igniting the flashlight powder. In attempting to pour some of the powder from a flask into the firing tray a short circuit in the wiring caused a premature spark, which ignited the powder in both the tray and in the bottle. In flash-light photography the danger to others is to be considered. In one celebrated flashlight law-suit, damages were exacted from a photographer whose flash-light scared a boy trespasser. The boy, being frightened by the flash, fell off a sled and broke his ribs. The jury could not see the responsibility otherwise, and the photographer had to pay. Amateurs are strongly advised to keep away from manufacture of flash powders. There are numbers of precautions to be taken in such work, and in spite of them, flash-powder manufacturers themselves often go up in smoke. In 1922, the City of Chicago passed the Certificate Of Fitness For Flash Light Operators stating that: It shall be unlawful for any person, firm or corporation licensed under the provisions of this article to employ, or to permit or allow any person, including the licensee, to use flashlight powder or to take flashlight pictures, unless the person using such flashlight is at least twenty-one years of age, is able to understand the English language, is familiar with the business of flashlight photography and understands the hazards to life and property incident thereto, so as to be able to take all the necessary precautions. A flashlight picture: Winston Dictionary Staff. The Winston Dictionary: College Edition. Philadelphia: The John C. Winston Company, 1946.
snapshot: Credit for characterizing an instantaneous photo as a "snapshot" (a hurriedly aimed shot) is usually given to Sir John Herschel. In the May 11, 1860, issue of the Photographic News he wrote about the possibility of taking a picture by snapshot - securing a picture in a tenth of a second. Joe Nickell. Camera Clues: A Handbook For Photographic Investigation. Lexington, Kentucky: The University Press of Kentucky, 1994. pg. 24. 1919 - W. W. Stroud: Bulletin of Photography: The Weekly Magazine for the Professional Photographer. F.V. Chambers, 1919. In flash-light photography: Camera Club of New York. American Photo-Pictorialists of Buffalo (Society). American Photographic Pub. Co., 1910. p. 280. The light source: James A. Sinclair, F.R.P.S. The Sinclair Handbook Of Photography. London: James A. Sinclair & Co., Ltd. 1913. Chpt.IX. 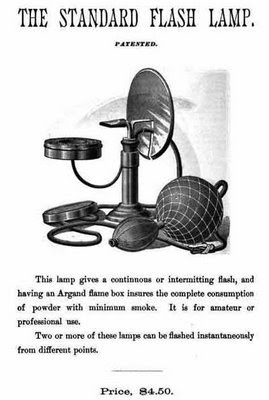 Flash Lamp Advertisement. The American Annual of Photography. 1913. Kodak Advertisement. Wilson's Photographic Magazine. 1906. Shades preempts "Friday From The Collectors" this week to announce some exciting additions to our digital publication. Starting November 2, 2008, Shades will welcome four new columns under the banner, Weekend With Shades. We have exciting contributors in the areas that have caught your interest. So help Shades welcome our new columnists and take a moment to read what they have planned for you. Where Law and Photography Meet! We're familiar with the Q&A Columns in magazines and online, but in our line of endeavor we know there aren't always answers, only Expert Direction. So Shades is launching a Q&E column and we've lined up some of those "in the know" to point us in the Expert Direction. Do you have a question about a family photograph or a photograph in your collection? Send an email to Shades, attach the photo, and we'll find the Expert with the Direction. Shades will contact you by e-mail if your question is chosen. If chosen, Shades may publish the picture and the Expert Direction in this digital publication. The Way It Was will be a series of posts on life as it was When! Starting next week Shades will host an article about Visiting Cards. In a recent challenge by Denise Levenick, The Family Curator and a Shades Friday From The Collector, lost treasure was discovered relating to the Victorian custom of visiting cards. Shades will launch a series of articles to show and explain this example of life, "The Way It Was." And so it begins! Shades hopes you will enjoy the changes and challenges with us in the coming months. One only has to look at these scrapbooks to realize that history isn't what historians tell us. 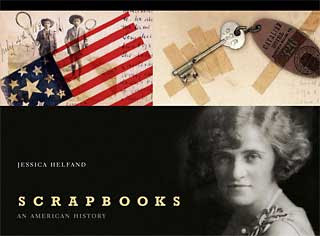 Scrapbooks by Jessica Helfand examines scrapbooks from the nineteenth century to the present, concentrating particularly on the first half of the twentieth century. The book is filled with color photographs from more than 200 scrapbooks; some made by private individuals and others by the famous, including: Zelda Fitzgerald, Lillian Hellman, Anne Sexton, Hilda Doolittle and Carl Van Vechten. This book is so fascinating, I'm not sure I'll ever be able to put it down. I am so taken with the hundreds of examples of yesterday's scrapbooks, their brush with history, their tangible examples of real life. The scrapbooking of yesterday seems so far removed from that of today; they're not a contrived version of history or life. And yes, green! These scrapbooks of old are filled with the bits and pieces of their authors' lives. Ticket stubs, torn letters, stamps, fabric, string, and a thousand things we throw out on a daily basis. There are several scrapbooks shown with very inventive themes. I was particularly drawn to the scrapbook of locks of hair. My husband's family has a photo album filled with locks of a cherished child's hair. A child who died young and tragically. Do we still collect locks of hair? I don't know anyone who does. The album of monograms, once a very prevalent part of life, was graphically beautiful. Modern day scrapbookers can draw on some of the more inventive ideas and incorporate them in today's themes. F. Scott Fitzgerald's mother had a scrapbook page of his signature at different ages, starting at five. What a brilliant idea! I am going to do this for my grandson's. This project percolated in my brain (and my sketchbooks) for years until I realized that scrapbooks were simply visual autobiographies filled with stories waiting to be told. I am fascinated with the degree to which non-visual people felt, for whatever reason, compelled to keep these remarkably visual records of their lives. Its a chapter in American history (and in graphic design history) that has not been told: in my book I call it outsider art with insider knowledge. It's raw and primitive and heartbreaking and real, and if it bears little if any resemblance to contemporary scrapbooking, it's probably because a generation ago, people made things from the detritus of their lives: they rescued things, saved and savored them, and pasted them in the pages of books. And therein lies the scrapbook's particular and enduring magic. Jessica also authors a blog called The Daily Scrapbook with beautiful examples of some of the scrapbooks she's collected. This richly illustrated book is the first to focus on the history of American scrapbooks — their origins, their makers, their diverse forms, the reasons for their popularity, and their place in American culture. I loved it! Not necessary for a superior artist to make extravagant claims. Thunder is all noise; lightning does the work. I have a deep affection for Abraham Bogardus. After all, he came up with the name of this digital publication. I have read a great deal about him and have found him to be extremely witty and an intellectual. He also appears to have been cantankerous and involved in something that looks a lot like price fixing, but that is for another article. Today Shades shares some biographical information. Enjoy! Photography has so completely entered into our every-day life and work that we are apt to overlook the fact that there are still living among us a few men who saw its first beginnings in 1839, and who have followed its rapid evolution as practical workers. Among these pioneers, Abraham Bogardus, of whom we present a recent portrait in this issue, is a notable figure. A few particulars of his career will, we are sure, interest many of our readers. Born on a farm in Dutchess County, New York, 29 November 1822, Mr. Bogardus came to New York City in 1837 and "took lessons" in the new art of Daguerreotypy from G. W. Prosch in 1846. After two weeks' instruction he opened a Daguerrean Gallery at the corner of Greenwich and Barclay streets. During his first week in business he made only one portrait, the second week two, and in the third week none. At that time sitting for one's portrait was quite an undertaking, the exposure time required being forty to sixty seconds. Very soon after, however, the time of exposure was shortened and the Daguerreotype became popular and Mr. Bogardus gave eighty or more sittings per week. Within a few years the paper photograph displaced the Daguerreotype, and the Bogardus Gallery was moved to Broadway and Franklin streets to meet the new conditions. During the first popularity of the Carte-de-Visite Mr. Bogardus kept three skylights busy and delivered from 68 to 100 dozens of Cartes per day. Among his contemporaries at this time were Gurney, Brady, Lawrence, Insley, Hass, Harrison and Hill, the brothers Meade, Lewis, Bogert and other famous Daguerreotypists, now deceased. In 1869 Mr. Bogardus was elected the first president of the National Photographic Association, and served, by continuous re-election, for six or seven years. During his long career in business he took an active part in the public life of the profession, and by his work and activities was widely helpful in shaping the present prosperity of the American photographer. He retired from active business life in 1887 and has since lived in quiet retirement in Brooklyn, an interested reader of current photographic literature and a frequent contributor to the St. Louis and Canadian Photographer and other journals. With many of the older workers, Mr. Bogardus still believes the silver-plate Daguerreotype portrait the best thing yet achieved in photography, and it is a hobby with him to restore old and tarnished Daguerreotypes to their pristine freshness and beauty. Readers who possess any such Daguerreotypes and desire to have them restored (a difficult and uncertain task in unskilled hands) may safely entrust them to Mr. Bogardus, who may be addressed at 129 Herkimer Street, Brooklyn, N. Y. Our portrait of Mr. Bogardus was made expressly for THE PHOTO - MINIATURE by Mr. W. M. Hollinger, of New York, and we are pleased to be able, by his courtesy, to publish so clever a likeness of the veteran photographer. Note: Bogardus died in 1908. Unknown. "Biographical Note." The Photo-Miniature. 1905. pp. 664-666. 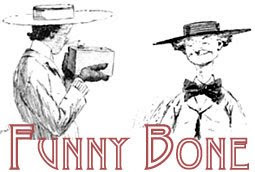 Becky Wiseman of kinexxions has presented Shades readers with an absolutely superb edition of Funny Bone - Smile For The Camera. Becky won the right to host the Smile Carnival during the Genea-Blogger Games and right about now I'm sure she's wondering exactly what it was she won. Well Becky, my thanks for all your hard work and admiration for the excellent lead-ins you've written. Carnivals are hard work. Now The Call For Submissions! 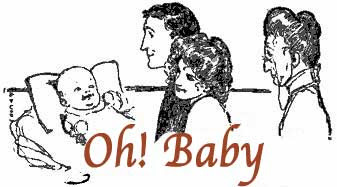 The word prompt for the 7th Edition of Smile For The Camera is Oh, Baby! Show us those wonderful family photographs of babies, or those you've collected. Share the ones that are too cute for words, or those only a mother could love. Your favorite of grandma or grandmas' favorite. Grandpa on a bear skin rug or grandpas' little love. Everyone has a baby photo, so let's see it! Choose a photograph of an ancestor, relative, yourself, or an orphan photograph that is the epitome of Oh, Baby! and bring it to the carnival. Admission is free with every photograph! Your submission may include as many or as few words as you feel are necessary to describe your treasured photograph. Those words may be in the form of an expressive comment, a quote, a journal entry, a poem (your own or a favorite), a scrapbook page, or a heartfelt article. The choice is yours! 1. Send an email to the host, footnoteMaven. 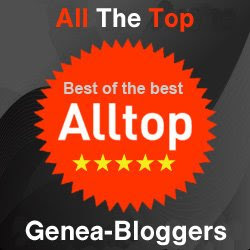 Include the title and permalink URL of the post you are submitting, and the name of your blog. Put 'Smile For The Camera' clearly in the title of your email! 2. Use the handy submission form provided by Blog Carnival, or select the Bumper Sticker in the upper right hand corner. See you at the Carnival!